Full of silk sunflower blooms all the way around the garland. Sunflowers measuring from 3-5 inch in diameter each. Sunflowers symbolize the sun itself, defying warmth and happiness, adoration and longevity. These silk flowers are made to last for years to come. 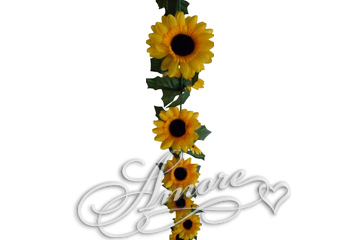 Decorate your wedding event with these silk sunflowers or use them to decorate your house.